At She Speaks We Hear, we are always on the lookout for diverse women doing interesting and varied things. We are especially keen to platform and publicise women who are making an impact in a niche or speciality area. So in 2016 we are hoping to share with you interviews with fabuladys who you should know about! (If you are a fabulous woman doing great things and would like more people to know about you, then get in touch! You can either submit a piece for the site or you can be interviewed). Last month we interviewed Dr Sukaina Hirji, this month we have interviewed Mariam Khan, a multi-talented blogger with a huge following. See below for the interview. SSWH: So Mariam, please tell us about yourself. Mariam: I currently work at the Royal Shakespeare Company in Stratford Upon-Avon in the Press and Communications department. By day that is my full time job. Many of my other hours are devoted to reading (mostly Young Adult fiction), blogging and going to the theatre and other adult life stuff. I also run a Twitter chat every Tuesday evening at 7.30pm called #FeminismInYA. Although we discuss themes in Feminist themes in Young Adult fiction these are often synonymous with real life issues women face. Fiction can often be the catalyst to drive change in real life and I hope that the small chat I host on Twitter creates change in people’s thinking, opens their minds and makes them look at real life and fiction with a renewed perspective. SSWH: Why did you start ‘Hello I Am Mariam’? Mariam: I started my blog because my creative writing lecturer Alyson made me. Honestly I had no intention of being online or sharing any part of my life or my opinions online. My lecturer encouraged blogging as a platform to receive feedback on my writing. I guess slowly I realised I could share my opinions online and this was a great way to express myself so I just did that. I’ve never really had a plan, I talk about what I love and what affects me. SSWH: You identify yourself as a feminist, why does feminism appeal to you? Does it contradict with your faith? Mariam: I do identify as a Feminist. However I also have issues with Feminism. I recognise that the Feminist movement in its early years favoured white women. Even today, I get upset and frustrated by how Feminism is mostly championed by White women. I mean, I love Emma Watson but where is the Asian Feminist equivalent in our society? There isn’t one and if there is THAT-woman of colour is definitely not championed the way Emma Watson is. Google will tell you Feminism is: “the advocacy of women’s rights on the ground of the equality of the sexes.” In today’s society I believe it is only fair that women and men be allowed to start from the same starting point. Men can do some things women can’t, or have to try harder to do but then it goes the other way. Women can do things men can’t. Except women are still seen as second class citizens. Even synonmousing Feminism to Gender Equality makes me cringe because what does that mean? In my opinion Gender Equality is different to Feminism. Gender Equality is the equality between two genders. But even here, I think, but there are some aspects that can not be made equal. Is it fair that women get upto a year off to have a child and men don’t? But then women get periods every month and men don’t. This is why we need Feminism. Feminism highlights women’s needs. It highlights why men and women are not equal, not in a malicious way, just in an a factual focused way. Islam and Feminism. This is a topic I have purposely avoided writing about for the longest time for many reason. The main reason is because I don’t have enough knowledge to address this question. So my answer to this question won’t be extensive and it won’t really be an answer. The only thing I will say is that although there are differentiations between man and woman in Islam I believe in my personal opinion as a Muslim woman that Allah has established these differences and duties because he is all knowing. Women in Islam are respected, what the modern-day culture does with their interpretation of Women’s rights in Islam is up to them but honestly did our Prophet Mohammed (S.A.W) hit his wives? Swear at them or curse them? I don’t think so. Yes he had many wives (to Western standards) and yes modern day Western Feminism wouldn’t appreciate this but he didn’t live in the West. How is it fair to apply the Feminist movement (concocted in the West) and apply it to a religion and culture of women without taking their beliefs into account too? This, I have said previously is my problem with Feminism, the lack of intersectionality or openness to other beliefs and religions. 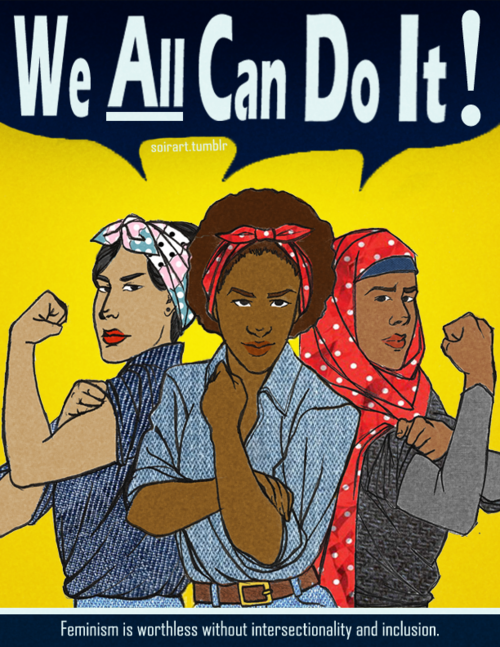 We are not all white women and this is why Feminism is different for us all. I’m still working out how compatible Islam and Feminism are but I’m getting there and it is a hard question and an even harder journey so bear with me. However I don’t believe that Islam and Feminism are incompatible. My religion doesn’t restrict me, I’ve been a Muslim for 23 years and I have never felt restricted by my religion, culture on the other hand is another thing. Don’t get it mixed up! SSWH: Thank you for your in depth answer, to the last question. Turning now to your writing, what made you decide to write book reviews? How diverse is the publishing industry and specifically, the book reviewing community? Mariam: I write book reviews because I want others to read, I would love for someone to read a book review I wrote and then in turn buy an actual book or borrow the book from their library because of it. I think the publishing industry has realised that it actively needs to encourage diversity and is working on that right now. The book reviewing community is wide and there are bloggers from everywhere but there is always room for improvement. SSWH: What is your favourite book? Mariam: My favorite book. Wow, you need to stop with these tough questions! One of my favorite books has to be ‘The Alchemist‘ by Paulo Caelho. It’s about a shepherd boy who goes on a journey the story acknowledges our humanness, and our ignorance as humans of what is around us and the world that we live in. Every time I read this book I look at life with wider eyes and a sharper mind. SSWH: Which author inspires you the most and why? Mariam: J. K. Rowling is the author who inspires me. There are many others I could mention but I grew up on Harry Potter. J. K. Rowling created a world where children didn’t feel powerless. She created a world where children could escape. She inspired a generation of children and young people to read and that in itself is inspiring. SSWH: You also feature advice blogs for your readers, what motivated you to share your wisdom with others? Mariam: I wouldn’t say I share wisdom, I sort of tell my stories and then hope someone will read them and not make the same mistakes. Or if I offer advice it comes from a personal mistake I’ve made. I do not pretend to know about things I don’t. I am only 23 and recognise life needs to happen but there are things I do know something about. Things I struggled with in University or at work and if writing about these things could possibly make someone else feel positive about feeling the same way and not like they are on their own on a deserted island then I am all for writing and sharing my experiences. I like to talk to other people and explore the things we have in common and those we don’t. The reason I started the Graduate series on my blog is to demonstrate that no two graduates have taken the same path towards their dream job. As a young person I always wanted to know how to get places in life and speaking to other people not and sharing their stories on my blog I hope that young people today realise there isn’t a set path, we are all making it up as we go along. SSWH: Now for our final question, could you tell us what advice you would give to anyone who wishes to start a blog site? Mariam: If you want to start a blog just do it. Be kind, be true to what you want to write about. Get involved in the community of bloggers you want to join. Don’t steal anybody else’s work – because that is called plagiarism. There isn’t a set way to do things and although it can be difficult sticking to your niche, your personal point of views, things that have shaped your opinions will be much more interesting than just saying the same thing as the 40 bloggers before you. I have done a few posts on blogging tips. I like to question things, to unpick them and then put them back together again. That is how I learn and I’m still learning about Feminism and about my religion and about a lot of other things. Disclaimer: the opinions expressed in this article are solely those of the original author and interviewee, and do not necessarily reflect the views of the website. Image courtesy of Mariam Khan. Categories: interviews, Writing | Permalink.